To start using Graphic Map, click on ‘Get Started’ and type in your name and the title of the graphic map then click Next. Choose the items you want to list by checking the boxes next to each one of them. There are 5 items to choose from :chapter, money, time, scene, and other. In the following page select how you want items rated and provide details corresponding to your chosen item. When you are finished you can then print and share your final product with others. 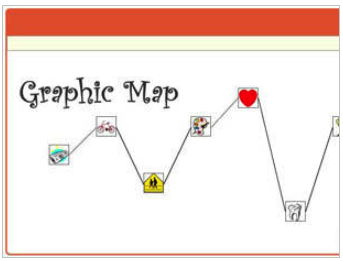 Graphic Map is easy and simple to use. No software download is required.